Lay the chicken flat between 2 sheets of wax paper. With a mallet, flatten each breast half to about 1/4″ thickness. Place 1 slice of ham and 1 slice of cheese on each breast half. Beginning at the narrow end, roll up and press the meat firmly together. In a pie plate combine flour, salt and pepper. In a second plate, spread the bread crumbs. And in a shallow bowl, beat eggs and water. Roll a chicken piece in flour, shake off the excess; dip in the egg mixture and roll in bread crumbs, pressing crumbs evenly onto the chicken. Place the coated chicken on a wire rack and let stand for 20-30 minutes at room temperature to firm the coating. You can also prepare in advance and refrigerate until 30 minutes before frying. When ready to cook, heat the oil to 375 degrees in a deep skillet. Fry the prepared chicken pieces over medium heat, turning occasionally with tongs for 8 minutes or until golden brown. Drain on paper towels, garnish with lemon wedge and parsley if desired, and serve hot! 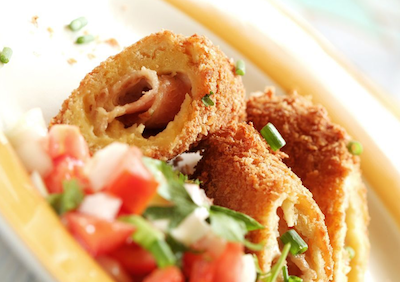 This entry was posted in Poultry, Recipes and tagged Chicken Cordon Bleu, Grade A Poultry, Passanante's Home Food Service, Recipe by Passanante's Home Food Service. Bookmark the permalink.